Coordinate social worker action in each of the affected countries to provide better understandings and responses to refugee needs during their journey, transfer and integration in the asylum countries. Provide a focused strategy that supports vulnerable groups such as unaccompanied children and young people, older people, those with health issues and trafficked persons. Establish a comprehensive political advocacy strategy that reflects a ‘ground up’ perspective on refugee needs, aspirations and solutions. Develop social work models that support refugees in isolated or life threatening situations where other forms of assistance are not available. Including that there will be an increasing number of refuges who face closed boarders or hostile host communities who will face the critical dilemma of staying where they are not welcome or returning to a war situation that may result in their death. Enhance the skills of social workers working with others to constructively develop inclusive and cohesive societies. 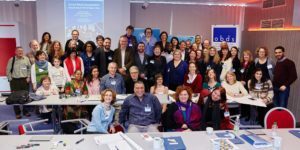 This organised response from the social work profession and refugee representatives was developed at the professions own initiative, independently from any government and as a result of the absence of any substantial regional or international coordination. Participants agreed that the lack of political cohesion has devalued the dignity of those affected by the crisis at all points during their journey and eventual integration into asylum countries or in facing the consequences of returning to a war zone. Social workers will continue to increase partnerships with other agencies and professional groups to maximise results and we hope that this ‘from the ground up’ initiative will act as a catalyst for governments to work with us. Refugees are not helpless. They have significant resources, skills, strengths, and education. These human attributes should be the foundation for rebuilding societies, evidence from social work interventions across the world speak clearly to engaging people in rebuilding their societies. Social workers will continue to work with agencies and governments to uphold human dignity, ensure that people are treated with dignity and respect in the refugee journey, strengthen community and social interdependence and, above all, involve people in all decision-making over their futures. Along with providing direct specialised services, social workers will advocate that the political response must therefore look beyond the immediate crisis. It must focus on creating a worldwide environment enabling sustained social development, as envisaged in the Sustainable Development Goals. Establishing social capital and social justice are prerequisites for peaceful, economically viable and sustainable societies. As a result of this symposium stronger links have been established between social workers working in the war countries, transition countries and asylum countries. Key instruments have been identified to support the most vulnerable groups such unaccompanied minors, trafficked persons, victims of abuse, people with disabilities and single parents. Guidance is being formulated for social workers that work with refuges in all parts of the world. Social workers will involve the media and politicians in understanding the expertise developed through experience in creating international solidarity to understand the causes of the crises. The participants affirmed that the profession has a responsibility to be involved in social and political action to deescalate conflict in order to achieve socially sustainable and peaceful societies.